BACK PAIN: Why is it so common? Almost everyone will suffer from some form of lower back pain (LBP) at some point in their lives… So what is it that makes us so susceptible to LBP? The spine is the main boney structure in the back; it consists of thirty three vertebrae that work together to form the backbone of our body. These vertebrae alone cannot support the massive loads and high stress and strain that we put on our backs. The vertebrae require assistance from all our soft tissue structures, ligaments, joints, fascia and most especially our muscles. The back is full of muscles, big ones that cover large portions of the back, and more importantly small, deep muscles surrounding the spine, that provide stability and support. LBP can arise from a number of reasons, for example, an impact injury can cause damage to the structures. However for most people it is a result of disuse and sedentary lifestyles that cause muscle atrophy and weakness which results in injury or pain. Another important factor is our posture – without proper posture all the muscles of the back cannot work as they were designed and weaknesses and imbalances can form. 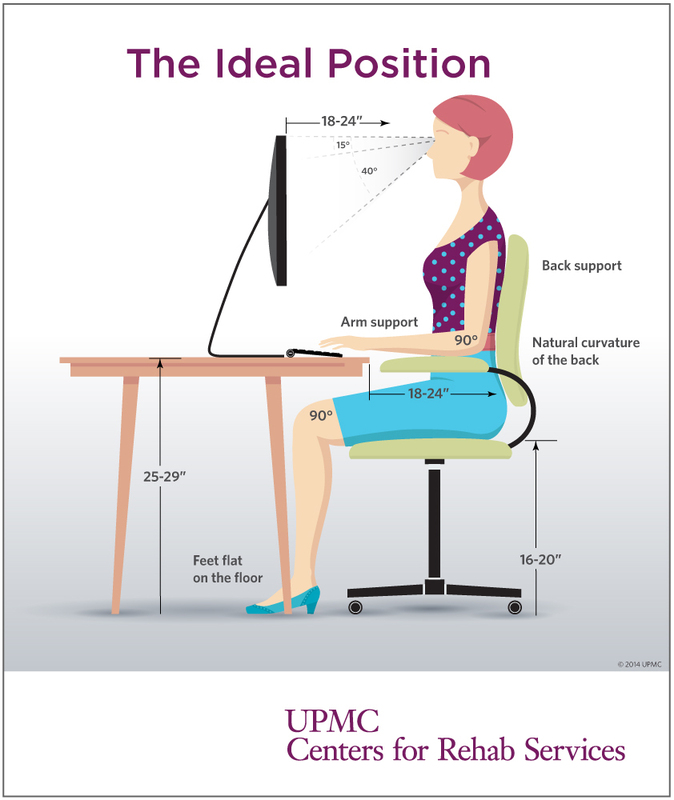 Below is an image of the ideal posture one should have when seated and standing. Our challenge to you this week is to try and maintain this type of posture throughout the day. It may feel strange at first as the muscles adjust to this new position, but the more you maintain this position, the more the body will adapt and function more optimally. So how do we combat lower back pain? First it is important to assess the cause of the pain. If there is an underlying condition such as a herniated disc or spondylosis, it is important to know what is happening in your back. Then one can begin an exercise routine to strengthen the weak muscles and correct the imbalances that have occurred. This will keep all the lower back muscles strong and working as designed to protect and assist the spine. Lastly, make sure you have good posture, both seated and standing, and you that you move around continually to avoid the muscles getting stiff, this will help to prevent back pain from beginning or from reoccurring. Always remember to keep moving and keep using the back the way it was designed, try to not be seated at a desk for 8+ hours or overloading weak muscles. If you have back pain, see a doctor, physiotherapist or biokineticist to have it looked at and find the best treatment plan for you to combat the issue. Then make sure to keep all those muscles strong to prevent the LBP from returning.